The Pomoca Climb 2.0 formula focuses on savings, both weight and cash. 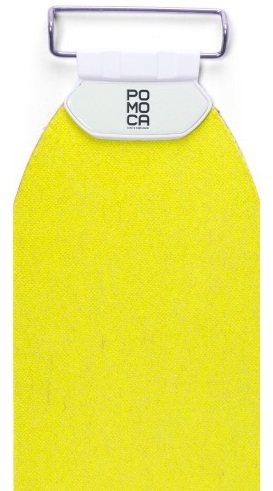 As of this writing, they are the lightest available trim-to-fit climbing skins for skis. Pomoca uses a short nap on its Safer Skin Light backing, making for an extremely lightweight and packable skin. They also shaved a few dollars off the price by skipping the S-Glide treatment. That makes this skin perfect for folks who like to step up the hill and not slide. For gliders, it depends on the grade of the climb whether the weight savings override the increase in friction. For everyone, it’s nice to have bright yellow skins and save a few dollars. Safer Skin Light backing formula is thin yet waterproof and tear-resistant. Ever Dry 2.0 treatment repels water, ensuring the skin starts and finishes light. Click Lock tip system lets you swap brackets to fit different tip shapes; two included. Kits include a skin bag and amazingly easy-to-use edge trimmer. Simple adjustable tail clips lock into slots on a sturdy plastic strap. Hi Teague! The Pomoca branded skins use a special North American glue formula. Most re-brands (esp. euro ski companies) do not. As always, avoid excess heat and sunlight on the glue! Would a 100mm width skin be adequate for a pair of rossignol seek 7 176cm that are 122-86-108? Hi Chris, that is adequate in my opinion. It will be essentially full coverage in the tail. I have Kastle TX82s that are 180cm long (119/82/107) what would be best size? Do the tails come pre-installed on these skins and length is adjusted by cutting the tip? Luckily, these skins come with tips and tails already attached! The 15 cm of length adjustment comes from positioning the tail clip along the tail, all you need to do is trim the sides to your skis! Hi my ski dimensions are 138-100-120. My ski length is 165cm. Will I be able to buy larger and trim down? My suggested size on the pomoca website is 130mm small, but this is not available. My ski is an Icelantic Oracle 100. It's got a bit of rocker in the tip. Hi Riley, the 120mm small (155-170) will be plenty of skin.